I just started bawling. I tried to find some news on Adji, and there is none. Nothing in the past hour, past week or past month. He is still missing right?? 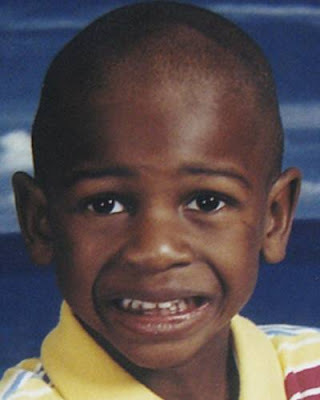 Why is there no news on this poor child? I wish there was news--looking for and praying for good news for Adji!!! Got my Anti Anthony Koolaid helmet on ,I'm ready! Thought maybe a 'private' start for funds would help without all the red tape. The only problem with that is the legal aspect. While yes we could get private donations in the name of Adji, we are not in the possition to be the ones to determine where and how the money should be spent, that would be something that the family would pick and choose, or any person put in charge on behalf of the family. For us to do this on our own, it could put is in a light that we may not want. Granted there is only a 50/50 chance that it could have negative rammifications, but that is a chance I do not think we need to take on our own. I would rather go through the propper channels and have all of my t's crossed and my i's dotted than be thrown into a web of confussion fueled by an IRS audit and legal suits because a penny was not accounted for propperly. Not trying to be negative, just trying to keep us all as clean as possible. When it comes to money, things can get ugly. Dolce, what if we quietly/privately between the monkeys just found whomever was to do the t_shirts and had them send money to cover the cost of t_shirts *to the company itself* instead of it going to one of us and then the company? maybe just order so many and get the money sent directly to the person/company doing t-shirts then deliver them to the person heading the donations part as a donation of t-shirts from the monkeys? I have just finished some work on Adji's page. Brandi Thank you for the lovely tributes to Adji. Also, Deenie, thank you too for the ones you contributed. Since we do not have many photos of Adji, Any of the tributes that you monkeys make and want on the site, just let me know and put them here,I will snag them and add them. Thank you all so much. Those have made a big difference in his photos on the site. Oh goodness, I am the wrong person to ask this question too. I do not know if there could be legal issues with this. To make a t-shirt we would be using Adji's image, that image is not ours to use, and although the money being used would be our own donated, technically since we are donating it to the cause of Adji, we forego the right to say where it should and should not be used. I do not know, is there any legal minded monkey who may be able to chime in on this one? Let me know if you need any more or if you need any artwork done. Searching I will give one of my CCSO contacts a call again tomorrow if I do not get a response from this community organization suposedly heading up the donations for Adji. She is who I called first for contact information on this organization, but will tell her of the wall I have met up with. If all else fails I will go and speak face to face with Maria and tell her that we are looking to further the exposure that Adji's case gets and wish to have her aproval. Just one more thing, would it be possible to get shirts for his family? When I speak with Marie I want to be able to offer a t-shirt to her and other members of the family that wish to wear them. Hmmm maybe we can order a few JUST for the family and you take them to the family and show them what we are wanting to do? If that was the kind of shirt you meant Dolce,maybe Brandi can help design a shirt to give a co. to get a price quote on just a few?? Brandi? Quantity makes a huge difference in pricing when it comes to shirts. I order them all the time for husbands company as chlorine eats through cotton t's. Maybe instead, a mock up of what the t-shirt will look like? I can put something together on poster board to present to her and show her how we want to do these shirts, and also get her input and suggestions to use. Thinking about this child and praying for him and his family. I have done the iron on's before, they run around $7 - $9 for a pack of 5 I believe. The only problem with them is that they fade extremely quickly and the colors tend to run in the wash. Shoot me an email and let me know how you want me to go with this, and I will put it together, take pictures, and drive over to speak with Marie for aproval and changes. Brandi - could you do a simple/chic 2 color border around the 2 facial pictures of Adji for the front of the t-shirts? Searching - what do you think of having on the back the words "Have you seen this child?" Listed in English, Creol, and Spanish and then placing the CCSO tip line number? Sounds good to me, or "Have you seen me?" it is shorter. Do we do "where is Adji" on the front?? and maybe include crime stoppers line or Missing children networks number or something.... maybe? and maybe include crime stoppers line or Missing children networks number or something on the back as well.... maybe? Dolce, email me with specs on what you'd like me to do. Include the photos you want, and let me know what format and size you'd like my graphics. These 2 photo's are the ones that I think we should use. Granted there are not many of Adji available that are very clear, but these photos atleast show him with 2 distinctive facial expressions. 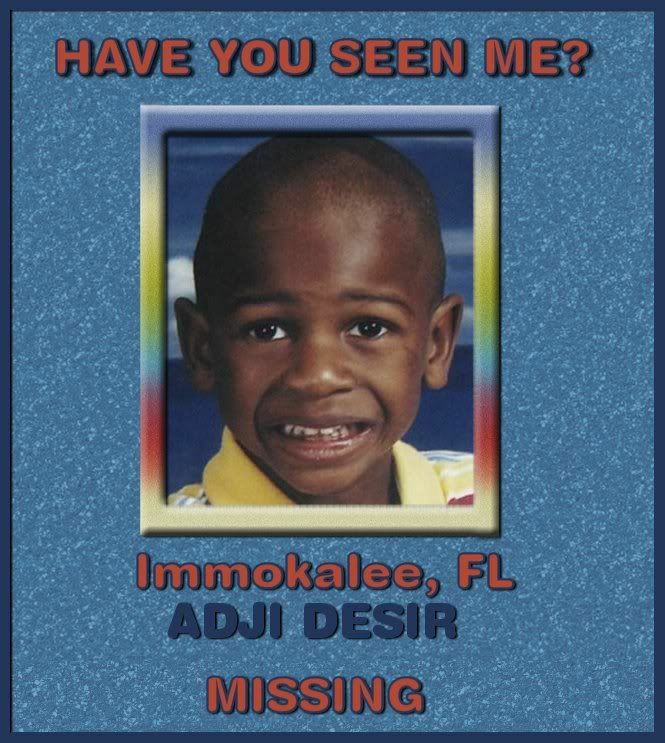 I can not wait to see the design..We have to keep our adji's picture and information out there so we can bring him home. I'll check this thread tomorrow. Page created in 2.164 seconds with 21 queries.